Location: Amersham Studios | London | U.K. I'm incredibly proud with just how popular this workshop has become and although I've been running it for a little while now, this Gelled Lighting Workshop is still my most sought after lighting workshop. I think it's fair to say that my work is predominantly known for it's bold use of colour and movement. One of the reasons this workshop has become so popular over the years is because that colour and saturation is all created in-camera with coloured lighting alone. 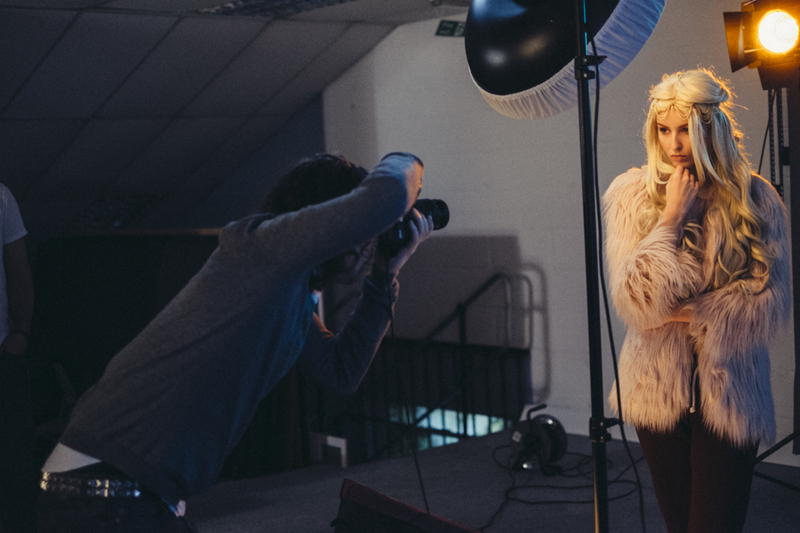 So if you're looking to add something a little different to your arsenal of lighting skills, or maybe you're simply looking to offer something a little more engaging and adventurous to your clients, this could be the lighting workshop for you. Subjective lighting: Let go of some of the rules of traditional lighting to create bold statements with colour. Essential lighting techniques to consider when using coloured gels: Creating saturated and bold colours as well as how to create softer subtler coloured looks with equipment you already have. The fundamentals of colour theory: Why colour theory is so important and how powerful it can be when used properly. How to apply colour theory with not only the lighting but with what your client or subject is wearing and the environment you're in. Learning how to fully control and manipulate light with advanced setups: We'll be in a fully equipped studio but we will also look at how we can reproduce these looks in far smaller studio spaces like home studios with limited kit. The course will be kept to a small group of 9 so there will be plenty of time for hands-on shooting for everybody. On the day of the workshop I'll be explaining in detail some of my most popular and sought after coloured lighting techniques. We'll start off by looking at how we can add interest with colour to your standard studio lighting shots, then we'll be covering strong edge lighting techniques with gels and then finish up with a setup which involves a highly saturated colour wash. Throughout the day I will encouraging everybody to ask questions and I will be covering how to overcome some of the classic pitfalls usually encountered with gelled lighting. Everybody will get a chance to shoot on each of the set-ups and everybody will walk away from the day with plenty of killer shots. Scroll down to the bottom of this page to see some of the images created on previous workshops. The course is aimed at those looking to explore intermediate with some advanced lighting so some previous experience of off-camera lighting is preferred and advised. It doesn't matter if that's speedlights or strobes, the techniques learned on the day are transferable. So if you're comfortable shooting in manual mode in your camera you should be fine to understand everything presented to you at this workshop. All you should need on the day is a DSLR with a portrait lens; anything from 50mm to 105mm will be fine. You should also be happy to shoot in full manual mode and familiar with what that entails. I'll be shooting with a Nikon on the day and if you'd also like to use some of my more obscure lenses you're more than welcome to do that too. What's included with the price of the workshop? A full days face to face training with myself plus plenty hands on shooting time on each of the three lighting setups with our top model guaranteeing you some fantastic portfolio images. All lunch, teas, coffees and snacks throughout the day will also be provided plus complimentary pick-up and drop-off at the local station is also included. Plus: All attendees on the day will also receive my complete PDF of course notes including best practices, colour theory and comprehensive lighting diagrams. I will also invite all attendees to into a private Facebook group after the workshop where I will provide feedback and advice on your future gelled lighting shoots free of charge. A brief behind-the-scenes look at one of my workshops on using gelled lighting in your flash photography. This video gives you an overview of just some of the topics I go over on the day. 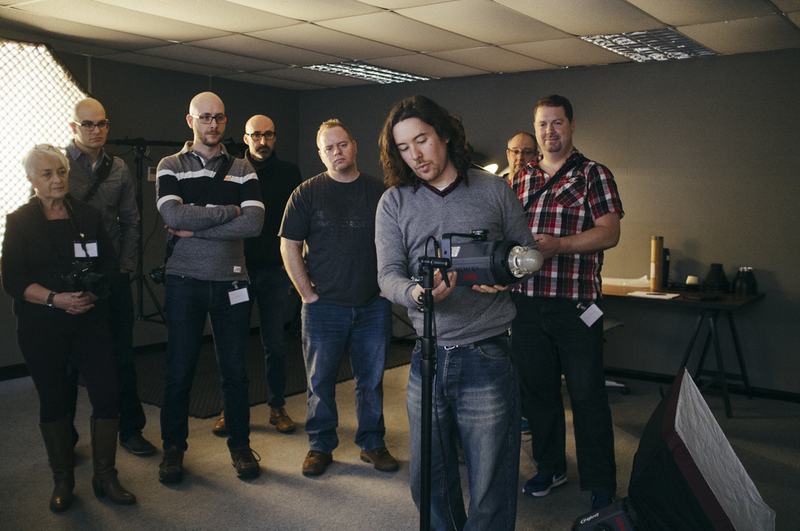 What did previous attendees have to say about my Gelled Lighting Workshop? Very humbling and kind words indeed but of course feel free to ask me any questions about what's involved on the day. The workshop is being held at Amersham studio which is based just outside London UK but still on the tube network so it's easily accessible for all. Simon the studio manager also provides complimentary pick-ups and drop-offs from the local station two minutes away. If you'd like to find out more about the studio that hosts instructors from all over the world then follow the link here "Trade Secrets". Spaces are limited so I would definitely book sooner rather than later. UPDATE: Ever since my very first Gelled Lighting Workshop back in November 2015, every single one of them has sold-out! I've had people flying in from all over the world to attend them, some even coming from as far afield as Seattle, Germany, L.A., New York, Kuwait, Australia! So if you'd like to see what we got up to, take a look below at some of the images we took on the day. So the first workshop was a resounding success and everything went miraculously smoothly. I honestly can't thank everybody enough who helped make the first workshop such a great event for all involved and I can't wait to meet more of you at the next one. Here are some of the behind scenes shots from the day courtesy of Simon Ellingworth and also a few very humbling testimonials from some of those that attended. "Loved the course, loved Jake and loved the studio – 10/10"
"Jake was a great teacher making you feel like you had known him for years and was working with a friend. He made the complex lighting setups look really simple and he simply explained how to set them up. I came away with a new skill that I feel confident to be able to recreate. Jake was on hand to make sure you got the best photos from the day. Amber was a great model and made sure that you got the best image from each set up. The studio was a great teaching space coffee and soft drinks at hand all day and provided a cracking lunch. I look forward to future courses with Jake and this team. "I recently attended Jake's 'Colour Narratives' and how to create them in camera, at The Amersham Studios. It was a fantastic day and worth every penny, Jake is a lovely guy, very relaxed with a good sense of humor, he has a very calm approach with very good teaching techniques. Each lighting set up was fully explained with the corresponding diagrams on a big screen, we watched as Jake discussed the problems that might be encountered and how to fix them, it was a small group of 8 photographers so it was easy to ask questions, we all took it in turn to shoot, the model Amber was a delight to work with and moved from pose to pose which with the lighting set ups made great images to take away. I learnt a lot from the day, we covered 4 different looks each one explained perfectly, you don't need a large studio, everything can be achieved in a small area, all I have to do now is put all this into practice and thanks to Jake I am very confident that I can do just that. Thanks for a fab day." Here's one of the images that I took on the day of the stunning model Amber Tutton. This particular shot was from the first setup in the afternoon on using coloured gels as side lights. "Last weekend I had the good fortune to attend a fantastic photography workshop on gel lighting techniques with master tutor Jake Hicks Photography at Amersham Studios. Our model was the super talented: Amber Tutton Model. I learned an absolute shed-load throughout the day and most importantly, I developed the confidence that I can apply the methods and philosophy to lighting in this manner, to my own work going forward. "I have been following Jake’s work for only a short time, it was in fact his portraits with Amber Tutton that first made me aware of his talents, but I was an instant fan and very keen to come along and learn more about his distinct creative photography. Jake was fantastic on the day, no question was too much trouble for him to answer despite the varying levels of experience in the room, and his willingness to go in depth about his approach, theories and techniques was both interesting, educational and exciting. I feel that I not only learnt a lot from the day from a technical aspect, but it has really inspired to experiment with my lighting set-ups and not be afraid to take a different approach to achieve something special. Overall it was a really fun day, and Amersham Studios was the ideal location (Simon could not have been more helpful and accommodating) and I would be happy to highly recommend it to anyone interested in learning a little more about Jake’s approach. The shot above was taken as part of the first set-up of the day in the morning. Here we covered some colour theory and how to build a shot, what to look out for and how to add more creative elements in-camera like blurring and flare. This shot of the stunning Amber Tutton was taken on the final set-up of the day. Here we used three separate coloured gels and blended them in a single shot. The main learning element here was how to create this complex lighting in a smaller environment and with simple equipment that most people already have. "Not only did I learn a hell of a lot but I met some great people as well. 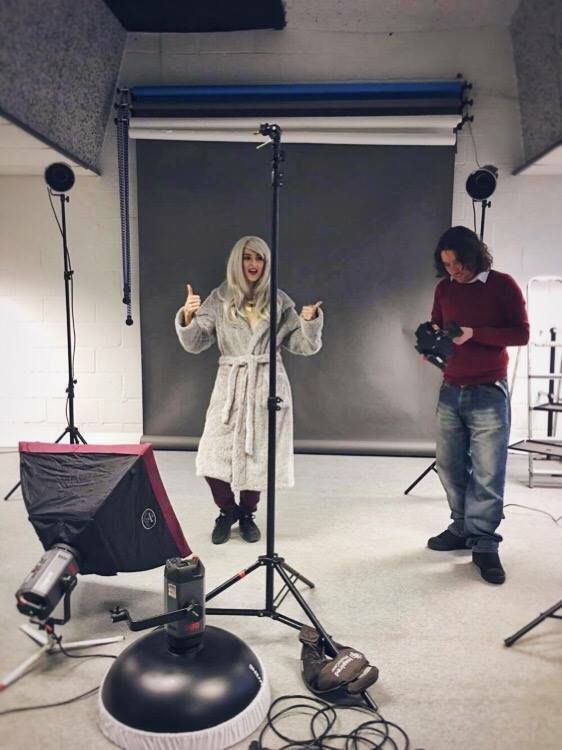 Besides Jake, Simon from the studio, Amber the fantastic model and Dan the Studio Assistant were all very friendly, accommodating and helpful throughout the day ensuring that our needs were met. And the other participants were all helpful, supportive and keen to learn. One of the attendees, Richard Wakefield, was gracious enough to go away after the workshop and write a blog post about his time with us here and how he found the Gelled Lighting workshop on the day. It's always very rewarding to receive positive feedback from attendees but when they are already as good as Richard is it's particularly humbling and gratifying. Here's a snippet of what he had to say about his time on my Gelled Lighting Workshop. "Jake's opened my eyes with regards to how far you can take these colour gels. It's ok to mix soft and hard light … its ok to use colours at opposite ends of the spectrum … it's ok to be bold … it's ok to be subtle! And the best part? Photos taken with Jake's setups look INCREDIBLE straight-out-of-camera." As a little bonus during the lunch break I managed to drag the attendees kicking and screaming (some more than others ;) ) to the other side of the camera lens so I could take their portraits too. "Jake is a fantastic instructor and I really enjoyed taking this workshop. We did several lighting setups throughout the day and Jake explained each of them thoroughly so we could have a solid understanding of the entire process. We all had plenty of time to shoot each setup and I came away with lots of great images. I feel confident about bringing gelled lighting to my own photography."